An evening to welcome new and returning members with a preview of the forthcoming Programme of Talks and a presentation of images on a theme of ‘Yorkshire’. Important information about this year’s annual print competition. Annual subscriptions are due. Focusing on three of his projects made over the past fifteen years, Mark Neville will look at the relationship between his images and the audiences which he targets through his works. “Mark Neville has re-imagined what documentary photography could be, should be. Instead of the bland ‘deconstructions’ that pass so lazily as ‘critical’ in contemporary art, he makes extraordinary pictures and finds extraordinary ways to get them back to those he has photographed” David Campany. Mark works at the intersection of art and documentary, investigating the social function of photography. He makes lens-based works which have been realised and disseminated in a large array of contexts, as both still and moving image pieces, slideshows, films, and giveaway books. His work has consistently looked to subvert the traditional role of social documentary practice, seeking to find new ways to empower the position of its subject over that of the author. Often working with closely knit communities, in a collaborative process intended to be of direct, practical benefit to the subject, his photographic projects to date have frequently made the towns he portrays the primary audience for the work. Points of reference for his practice might include the ideas of Henri Lefebvre, or the art works of Martha Rosler, John Berger, or Hans Haacke. Charlotte Graham tells stories in the national press through the use of beautiful photographs. Her work is regularly published in The Times, The Daily Telegraph, The Guardian and The Yorkshire Post – to name a few! A long-held interest and enthusiasm for photography and securing a front page picture in The Times led Charlotte to a full-time career as a news photographer working for one of the leading Northern picture agencies. From photographing the Royal family to catching a fighter plane touching down, her pictures capture unique, transient moments, with an eye for a picture that doesn’t rely on tired cliché. Picture editors and clients alike know they can rely upon Charlotte to deliver consistent, top quality images. Charlotte has a straightforward and direct approach to her photography, and her lively presentation will include a wide variety of her work. Lucy’s presentation will take you through the story of her ongoing documentary project, Of Life and Land. Since 2013, Lucy has been photographing the beauty and connections she treasures in the everyday life of the community and landscape where she lives in Ampleforth, North Yorkshire. Always drawn to the documentary work of James Ravilious, Lucy originally learnt darkroom photography while studying for a degree in psychology (Newcastle University) and masters in animal behaviour (Edinburgh University). For the following ten years she worked in wildlife conservation and rural development in the UK and Africa. Arriving in Ampleforth, Lucy was struck by the beauty she saw in everyday life and felt increasingly rooted by the sense of permanence derived from the deep layers of connection among the community and its landscape. After a diploma in photography (2012-13), she began documenting the landscape and ordinary goings-on in and around the village. Working in an unhurried, considered way is of great importance, giving residents a chance to become used to being photographed going about their daily lives. One of the key elements of Lucy’s work is its honesty and authenticity, which is wholly reliant on mutual trust and understanding between her and her subjects. Ben is an environmental photojournalist, with a focus on highlighting the beauty of the natural world, how we humans affect and interact with it, and important conservation issues. Ben Cherry has a passion for telling stories through photographs. He holds a Zoology degree and is seeking to develop his career to combine his science and photographic interests to inspire conservation efforts worldwide. A recent project was the Wildfowl Wetlands Trust conservation expedition from Arctic Russia back to the UK, called Flight of The Swans. Ben is a Fujifilm X Photographer, and has had successes in international competitions and has had his work featured in international magazines. Sponsored by Fujifilm and Bass & Bligh. A photographic journey abandoning traditional 'reality' based photography to Andy’s impressionistic style, which he calls 'Abstract Landscapes', Andy will reveal some tips on how he achieves his effects. Andy Gray was raised and is still based in rural Northumberland, where familiarity spurred on the development of his unique impressionist/abstract style of photography. Blending ICM (Intentional Camera Movement) techniques and years of Photoshop experience, Andy produces a more painterly, ethereal view of our landscape. Andy will describe why he moved away from traditional photography, how his techniques evolved, go through the minimal equipment used, and reveal through his images stories of capture and development, with valuable insights into the processes used. An evening of humour and wit, wry observation, surprise and delight, featuring some of the best street photography by a master of his art. David Gibson has been taking street photographs for more than twenty-five years. He is one of the founder members of in-public the international collective of street photographers and his work has been widely published and exhibited. He is commissioned by some of the UK’s leading design groups and he supplies several picture libraries with his images. In addition David regularly leads street photography workshops in London. - published by Thames & Hudson in 2014. - published by Prestel in 2017. – individual projects, favourite genres of photography, and a potpourri of images. Tom will show a selection of images from his vast portfolio of photographs of mountain landscapes, travel, flora and people, taking in a variety of wilderness environments. Tom does not feel constrained in any way in his photography. He has been lucky to have been able to travel and photograph in many parts of the world, having climbed some of the most impressive mountains in the European Alps, trekked amongst the ‘giants’ of the Himalayas, ice-climbed in Norway and made some 10 first ascents of mountains in the Arctic. However, he still finds that his familiarity with Snowdonia in North Wales where he still finds some of the most satisfying and challenging days out, especially perhaps in winter. Tom gained a Fellowship of The RPS with a B&W panel of mountain landscapes printed in the darkroom. The ‘Distinction’ of the PAGB was achieved in 2010 with a set of colour and B&W prints of a variety of subjects. The latter was printed in the ‘lightroom’, and since around 2003 all of Tom’s photography has been by the digital process. Tom was awarded the Fenton Medal for services to The RPS, having been a member of both the Travel and Visual Art distinction panels. It was also a huge accolade for him to be elected to membership of The London Salon of Photography. Thomas Dodd is a visual artist and photographer who has developed a style that he calls ‘painterly photo montage’. He crafts elaborately textured pieces that have an organic and decidedly non-digital appearance. Thomas’s work often has mythic and quasi-religious themes that pay homage to Old Master art traditions while at the same time drawing from psychological archetypes that evoke a strong emotional response from the viewer. Although his artwork resembles paintings, his pieces are entirely photographic in nature, fusing many images into a cohesive whole. His larger works are often presented in a mixed media form that adds a depth and texture that complements the photography. Thomas has had numerous exhibitions of his works in many cities in the USA and around the world – recent shows have been in New York City, Paris, Mexico City, New Orleans, Tokyo, San Antonio, Seattle, and in his hometown of Atlanta. Thomas’s photographs have been featured in many magazines, on book and album covers. He frequently teaches workshops and webinars on photo-editing and marketing for artists. Thomas began his career as a visual artist in 2005. Before that, he was best known as the harpist and songwriter for the 1990s musical group Trio Nocturna, a Celtic Gothic ensemble. The images that Thomas creates are basically a visual equivalent of the music he composed in the 1990s. Mythic themes and their relation to emotions and psychological states continue to be his primary subjects and motivations. This talk takes you from the foundation of early Venice, to the creation, and demise of an empire; based on around 50 of Chris Ceaser's images that endeavour to capture the heart and soul of this magical place. Venice is a photographer's dream. Old palaces, architectural delights, narrow canals and bridges are everywhere in this city that time forgot. Nothing much has changed over the centuries, the modern Venetians effectively live an ancient Venice that is under constant attack from decay, the sea and a new threat, tourism. So how did this small series of Islands in the Adriatic become the Mediterranean's most powerful force in the 1300's? Where did they find their wealth? And how did it all end? This talk attempts to illustrate this in words and images. The Venice we see today may look just like it did 700 years ago but many Venetians have left and it is struggling to find a way forward as a city. Born in Rotherham, Chris has always lived in the Yorkshire region and currently lives in York. 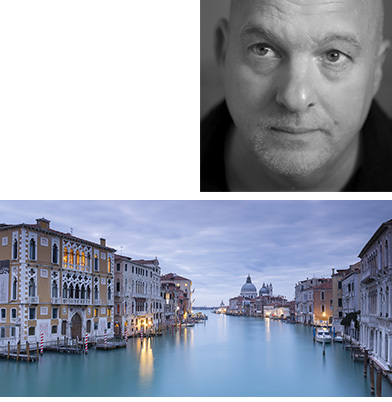 Chris Ceaser is a highly successful commercial photographer, and has his own gallery in Micklegate. In June 2010 he became an Associate of the Royal Photographic Society. He is an award winning photographer and was recently awarded the Antiquity Archaeological Photographic Prize. Inspired by the region’s exhilarating natural views; from the flower-strewn meadows and stone built barns of the Yorkshire Dales & the heather filled North York Moors, to the cliff laden beauty of Yorkshire's Heritage Coast, he strives to capture natural light to bring his images to life and capture the essence of each location. He has also compiled a powerful portfolio from the Lake District, Northumberland, Scotland, London and, more recently, Venice, Prague and Rome. In a change to the printed programme, Maureen Rush, Przemyslaw Puszkiewicz, Nigel Harcourt-Brown and Norman Oberheim will present their work. A set of short presentations by several HPS Committee members – be prepared to be surprised and delighted by their subject matter – but at present that’s highly confidential. Diving and photography are the two great passions in David’s life; this presentation features his exemplary skills at underwater photography, from working with models in swimming pools to photographing the magnificent creatures that swim in the oceans around the world. 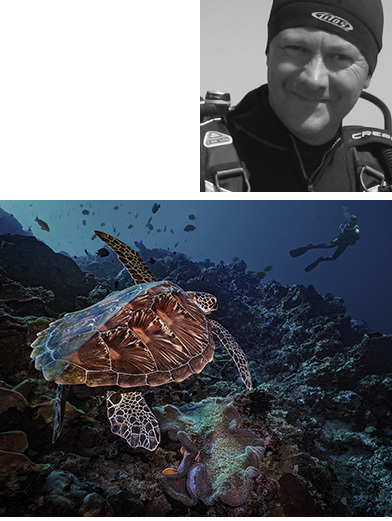 David Keep LRPS, CPAGB, BPE4 will bring along some of his specialist equipment, and explain the basics of what is required for taking up underwater photography. “WOW! Two hours of stunning images and videos. One of the best presentations this club has seen” Arnold and District Camera Club website. David Keep is a member of Rolls Royce Photographic Society in Derby, which is part of the North East Midlands Photographic Federation (NEMPF). He was the winner of both the PDI and Print Trophies for the highest aggregate score in the last (2017) NEMPF Championship, a mark of his image taking skills across several genres of photography. A joint presentation showing the best of Rusty and Barbie’s award winning and exhibition work spanning over 20 years. Rusty Lindsay is a digital imaging specialist by profession and works in the imaging lab of a National Schools Photography Company. He creates many of his images by using composites from several sources. Rusty considers that he is a photographic artist rather than a photographic reporter, but likes to include an element of humour in many of his creations. Rob Knight describes his talk as something a little different, and challenges the audience to have an active role in the presentation, in aspects such as how they can develop creatively. In this highly popular presentation, Rob will encourage members to think about and examine their past non-creative experiences, which may help shape who they are in terms of their creative perspective. Rob will show his ‘Dark Visions’ work, and will also describe his forays into drone photography and exploration of videography specifically around his #Washlands #OpenProject, and how this works in terms of graphic representations of the landscape. The latter part of his presentation will include projects and work directions informed by his education by a degree as a Geographer. Time permitting, Rob will table opportunities for a follow-up hands-on practical workshop exploring visual storytelling, project working and developing your personal narrative. Rob is involved as a curator for the #Connected exhibition. 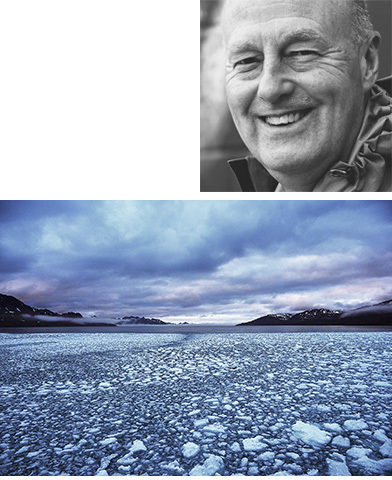 Steve Gosling describes his journey of a lifetime to Antarctica. Harrogate based Steve is well known to HPS members and we once again we are delighted to welcome him for an evening of photographic exploration. Steve is an award winning photographer, Fieldwork Professor for Phase One and Ambassador for Olympus, Manfrotto/Gitzo tripods and Permajet. In November 2016 Steve had the pleasure of being an instructor on a Luminous Landscape workshop to South Georgia & Antarctica. He spent three weeks sailing in the Southern Ocean, visiting amazing landscapes and witnessing the wildlife close up. who will give short presentations of their work. Ian’s presentation includes a mix of photographic encounters in the street plus sets of images from longer term projects, with advice on approaching these genres of photography. Ian Wray is a photographer and photojournalist based in Leeds; he is also a past President of Leeds Photographic Society. Although Ian’s photography covers a wide range of subjects, he has always been interested in the camera's apparent ability to create a true record of people, places and events. As a result he finds himself drawn towards photographing everyday life as it unfolds around him. It features work from around his home city of Leeds, as well as images taken further afield. The subjects of his projects are typically local events and institutions; pubs, cafes, a cattle market etc., with emphasis on characters who bring these places to life. The images in Mike’s presentation are inspired by his childhood fascinations with kaleidoscopes and Spirograph, and being captivated by the endless variation of colours and shapes you could create. Mike Curry has been a professional photographer for over thirty years. He grew up in Yorkshire and moved to London in 1982, initially working for several years in the Selfridges’ studio. In the last ten years, he has been concentrating on landscape and abstract projects commissioned by his commercial clients. Mike’s work has won awards in international photography competitions and has been published in the Sunday Times Magazine and Outdoor Photography Magazine. 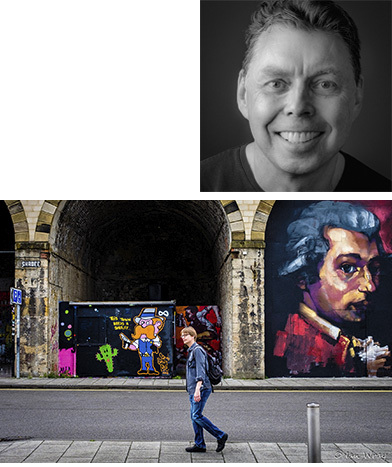 Mike teaches photography at all levels and has also given talks to camera clubs, sixth form colleges, The Master Photographers Association and the London School of Economics; he has recently been made a Fellow of the British Institute of Professional Photography. What motivates a photographer to have a complete change of lifestyle, buy a gallery, downsize from DSLRs and move to upper Swaledale? Attend and find out! Richard Walls reveals how he developed an interest in photography, explains why one of his photographs of Saltburn Pier became relevant to his move to Muker and acquisition of The Old School Gallery, his love of The Dales, his 'office' and working environment outside (This may make some HPS members envious!). Richard’s presentation also reveals why he changed from using DSLRs to more compact – and perhaps unusual – cameras, his subject matter and techniques. He will give hints and tips on some of the commercial aspects of photography – what sells, what doesn’t, and what photographers need to do to sell their work into galleries, plus the creative benefits of working on a daily basis with artists – how photographers and artists can influence and inform each other’s work. Paul started his photographic career in Leeds on the Yorkshire Evening Post when he was 16 years old photographing the emerging British pop scene. 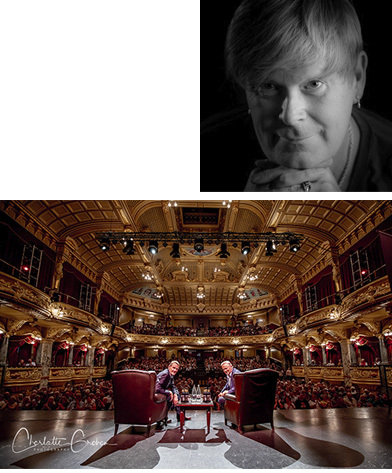 He has photographed legendary bands such as The Beatles, Rolling Stones, The Hollies, Pink Floyd and among the solo artists, Jimi Hendrix, Roy Orbison and Marianne Faithfull. Paul’s Beatles and rock legends photographs have been exhibited around the world in New York, San Francisco, Memphis, Prague, Dubai, London and, closer to home, Northallerton, Leyburn and Muker. Paul prefers monochrome images and still uses his Rolleiflex medium format camera as well as his Nikon F 35mm and Speed Graphic 5 x 4 cameras which he used to photograph The Beatles and other rock legends in the 60’s. Paul particular likes the grain produced by film which he says gives the subject a more appealing and natural look. His favourite subjects are the people of Yorkshire and its rich mix of fabulous landscapes both in the country and the coast. Paul Berriff is also a television documentary film maker and has been presented with over 18 international awards for his work including two BAFTAs for Best Documentary and a BAFTA nomination for Best Cinematography. Last year year Paul was presented with the Guild of Television Cameraman’s prestigious award for outstanding work in TV cinematography. Fifty Years Behind The Camera talk is an audio visual presentation of Paul’s life and times with both his still and movie cameras. It features his photographic work with legendary pop groups and amazing stories and adventures while filming TV documentaries from James Bond to NASA astronauts. Paul has escaped death four times whilst in pursuit of the perfect image. He was blown off a volcano in Central America during an eruption, escaped from a major helicopter crash in the Scottish mountains, jumped from a sinking ship in the North Sea and was knocked unconscious and survived the collapse of the Twin Towers in New York during the 9/11 attacks. Paul was awarded an OBE in the Queen’s 90th Birthday Honours. Election of Officers and discussion of current concerns. (Items for discussion required by ???? March 2019).